The North Marion Huskies celebrated the collegiate signing of four of its athletes from the Class of 2019 on Dec. 5. 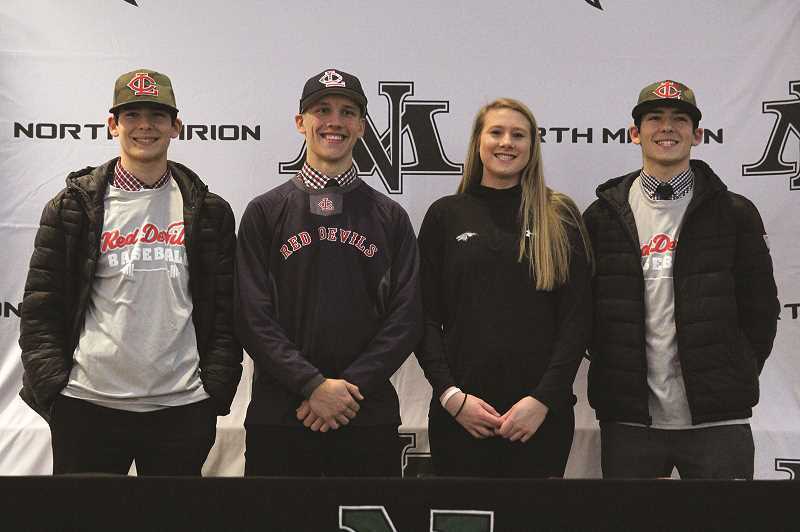 Senior middle blocker Paige Martin signed her letter of intent to continue her volleyball career at Cardinal Stritch University next year, while baseball players Griffin Henry, Grant Henry and Nic Iliyn each made their commitment to Lower Columbia College for the 2020 season. The 2018 Tri-Valley Conference Player of the Year, Martin helped guide the Huskies to a 9-1 record in league play for the program's first conference title since 1991 its first state playoff berth since North Marion moved to the 4A Classification in 2005. Martin was twice named to the all-conference team, as a Second Team honoree in her junior year and as the league's top player this year, leading the program to a winning record both years for the first time in a decade. Martin was the top recruit of the Cardinal Stritch Wolverines, part of a private Roman Catholic university located in Milwaukie, Wisconsin. An NAIA school, the Wolverines are coming off a 19-20 season, finishing second in the Chicagoland Collegiate Athletic Conference's North Division with a 13-5 record. The Henry brothers and Iliyn are entering their final season playing for the North Marion baseball team, which won the Oregon West Conference title in May and advanced to the 4A State Semifinals. Griffin Henry has garnered back-to-back Conference Pitcher of the Year recognition, sharing the honor as a sophomore in 2017 before winning the award outright as a junior this past spring. He was selected to the First Team All-State team as a junior and has been twice selected to the All-Conference First Team. Grant Henry was also named to the All-State First Team as a catcher in 2018, his second year making the All-State team after being selected as an Honorable Mention honoree in 2017. Iliyn joined his teammates on the All-State team this past spring, garnering Second Team honors as the Huskies' starting centerfielder. Like Griffin Henry, both Grant Henry and Iliyn were First Team All-Conference selections in their sophomore and junior seasons. All three players are joining the Lower Columbia College, a two-year junior college located in Lakeview, Washington. Part of the Northwest Athletic Conference, the Red Devils have won three of the past four NWAC Championships and four straight West Division titles, accumulating a record of 152-41 since 2015.